The Red Berries and Rhubarb Pie is so very easy to make. However, you have to be a little lucky with the letters that they are not overrun by the fruit juices. You can design any pie crust you like; the filling is made from strawberries, raspberries and rhubarb. A little lemon juice to add some tang. You will love these kind of fruit pies. When you mother is more than 4,000 miles away from you there is only so much you can do on Mother’s Day. One of the things I did, was making a pie in her honor. My mother is a great pie baker and the best mother a girl can wish for. I did not only bake it for her, I also ate it for her. There is no way you can ship a pie across the Atlantic and expect it to arrive OK. I like the combination of strawberries and rhubarb, but I did it a little different this time. I also introduced raspberries to the mix. I also tried to make the top pie crust Mother’s day specific and I think it came out OK.
Rhubarb is wonderful in a pie. It goes in hard and comes out wonderfully soft, stringy. Strawberries and raspberries let go of a lot or liquid, which is something you don’t want in your pie, so I prefer to make the mixture of the fruits as soon as possible and set it in the fridge with the sugars, cornstarch, salt, and lemon juice. On the one hand the mixture can cool, the cornstarch and absorb some of the moisture and on the other hand, once you are ready to put the fruit mixture in the crust, you can leave a lot of liquid behind. Scoop the fruit mixture in the pie crust with a slotted spoon. I know you will also leave behind the sugars, but that may be just a good thing, don’t you think. 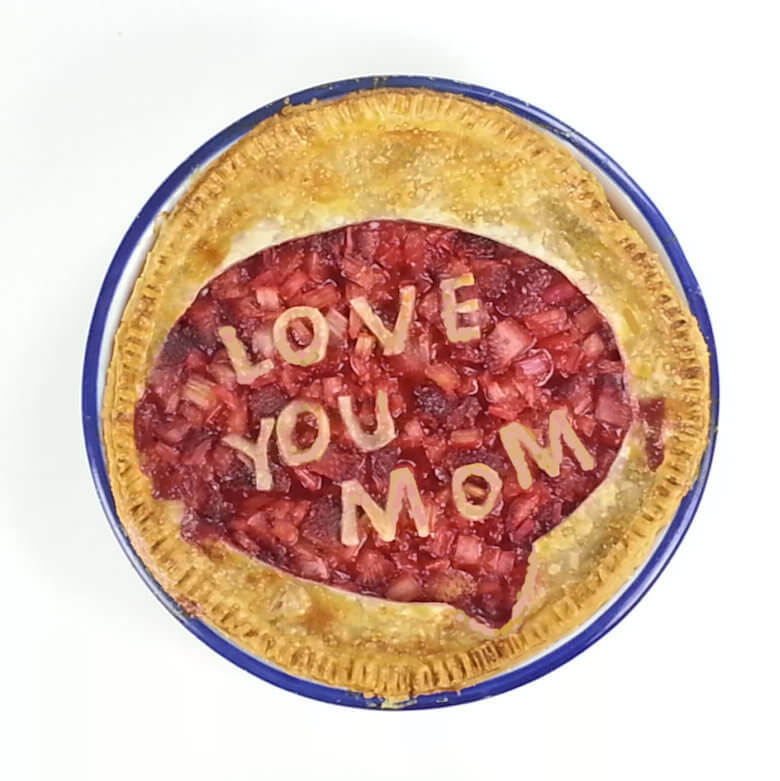 For the pie crust I made a special one for my Mother, being so far away. And even though we Skype on a regular basis, it is not the same as being there. 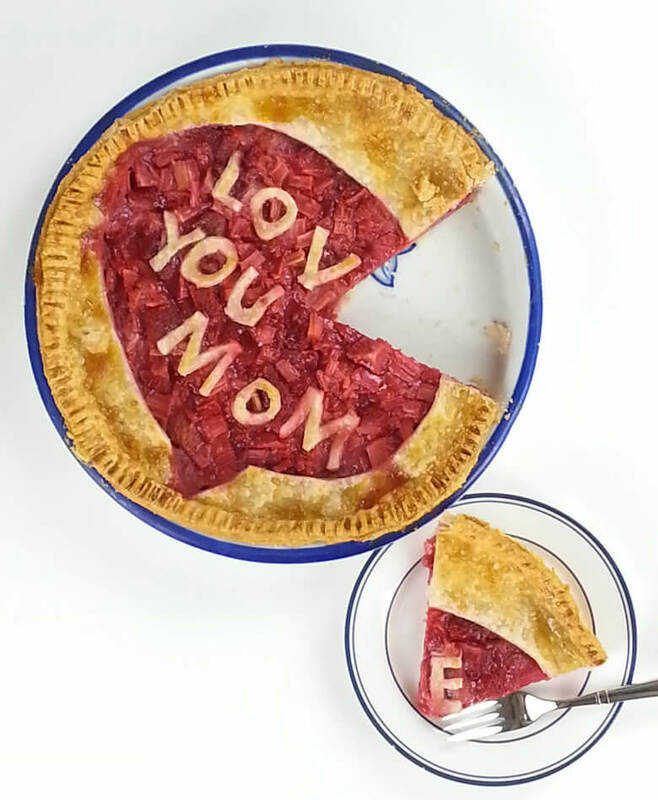 So Mom, this Red Berries and Rhubarb Pie is for you! I am calling out “Love you, Mom”. Stir the rhubarb, strawberries, and raspberries, brown sugar, granulated sugar, cornstarch, salt, and lemon juice together in a bowl and place in the refrigerator. Roll out one of the pie crust on a floured work surface, so it is just a little larger than your pie dish. Leave the other crust in the fridge. Spoon the filling into the crust. Use a slotted spoon, so you can leave all the liquid in the bowl. Remove the other roll of pie curst from the refrigerator and roll it out just a little larger than your pie dish. Make a lattice or create your own topping. Whatever you decide; press the edges into the bottom pie crust edges to seal with your hands or with a fork. Use a small knife to trim off excess dough. Mix the egg and the milk and beat to mix. Lightly brush the top of the pie crust with the egg/milk mixture and sprinkle the top with a turbinado sugar. Place the pie onto a large baking sheet and bake for 20 minutes. Turn the temperature down to 350 degrees F, while the pie is in the oven and bake for an additional 25-30 minutes. If the pie crust becomes to dark, cover it with some aluminum foil. Allow the pie to cool bfeore serving.